Bees and wasps are some of the most common insects that bother us at the family picnic. Severe infestations may even require professional pest control. Despite the nuisance these insects cause, they are some of the most beneficial insects to our agriculture. But knowing a little bit more about each of these types of bees will definitely help us identify them, and help us understand why they are necessary to our environment. This most common honey bee around is the European Honey Bee. This bee was not native to North America, but was introduced by European colonists. The EHB is a social honey-producing bee. It gathers with many other bees to form a colony. Then it spends its time pollinating flowers and other crops. This bee is non-aggressive and will not seek to hurt people or animals when left alone. Africanized Honey Bees are the ones we all have nightmares about and sometimes refer to as “Killer” bees. This bee is actually a hybrid of the European Honey Bee and African Honey Bees, that was accidently introduced in Brazil. The differences between EHB and AHB are extremely hard to detect, even scientists must use scientific techniques to determine their genetic differences. The most popular known trait of the AHB is its aggressive behavior. This bee is agitated much easier than a normal honey bee and will pursue the threat and remain agitated for up to 24 hours. This species will send out much more guard bees than the EHB and must be avoided. Bumble bees are similar to honey bees with a few key differences. Bumble bees are social bees just like honey bees but their colonies are much smaller with only a couple hundred bees in comparison to thousands of honey bees. Bumble bees also produce much less honey. Unlike honey bees, bumble bees only produce the necessary honey for their colonies and not much more than that. They are also very passive and will only string when their life is in danger. 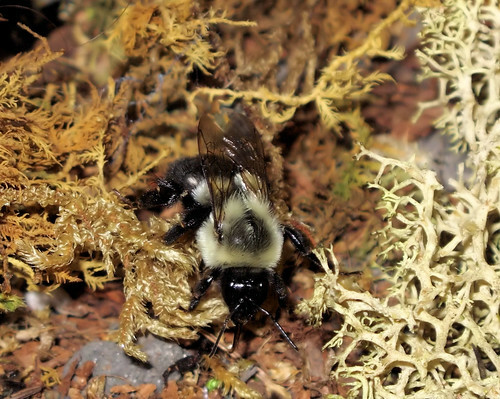 Ground bees are another type of passive bee and will not sting unless they feel threatened. These bees make their nests underground rather than in trees or high places. The female bee will excavate tubes in the ground to lay her eggs. Ground bees are solitary; meaning they do not live in large colonies, but prefer to be on their own. They also pollinate fruits and flowers, producing small amounts of honey. Another common bee is the Carpenter bee. These bees are also solitary. Like most bees, they pollinate plants ignored by honey bees. Carpenter bees can drill through wood which is where their name comes from. They chew through wood to produce tunnels to raise their young. These bees can cause some damage to wood, but sturdy wood structures are usually not affected much. Carpenter bees are quite docile. Male bees are seen hovering around “protecting” the home and will buzz over to any insects nearby. In reality, the male cannot even sting. The female can sting but generally is not easily provoked and will not approach you. Wasps are another common stinger. There are as many as 30,000 species identified. The sting of a wasp is probably the most painful and can sting repeatedly rather than just once. Wasps are not actually bees just another species of stinger bug that bothers us in the outdoors. Wasps have a much more elongated body than bees. They’re not as hairy as bees and have a distinguishable pinched waist. While most bees are social, wasps can be social or solitary. Wasps are predatory and parasitic insects. They prey on and lay their eggs on insects. Their larvae will grow and develop by eating away at whatever insect they’re on. Although, these bugs may seem cruel and gross they are very helpful to agriculture. Just like bees, they pollinate crops, but their predatory ways also help properly maintain the pest population. All of these bees, along with many others commonly found in our deserts, are quite annoying and can cause slight damages, but bees are some of the most important insects to our environment and agriculture. Not only is honey itself a sweet nectar, but also has a 19 billion dollar impact on American economy. Watch for Africanized Honey Bees. They’re Swarming!